This is our absolute favorite marinade for chicken. The longer you let it marinate, the more intense the flavour. We usually let it sit overnight in the refrigerator, but a few hours will do. In a large, resealable plastic bag, combine the soy sauce, wine, lemon juice oil, herbs de Provence, ginger, garlic, onion powder and ground black pepper. Place the chicken in the bag and mix together well. Seal and let marinate in the refrigerator for at least 3 hours or overnight. Preheat an outdoor grill for medium-high heat and lightly oil grate. Thread the chicken onto skewers. Grill over medium heat until done. Pour the marinade into a small saucepan on the stovetop, and bring to a boil over high heat. 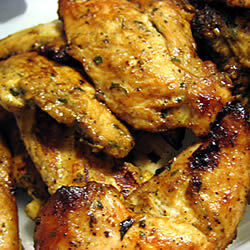 Pour reduced marinade over chicken when serving.